The so called “Geltinger Bucht” at the easter end of the Flensburger Förde is nicely situated at the border of a national park called Geltinger Birk, a nature reserve with wild horses, lots of birds and plants. It hosts a couple of spots which are perfect for beginners, freestyle or just a wintersailing / kiting session. 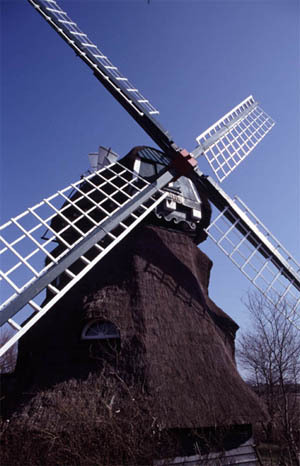 Wackerballig is nearby the little village called Gelting, which is situated between Flensburg and Kappeln. Just a few meters from the beach, a parking place (only for windsurfers) with room for up to 10 or 15 vehicles gives a comfortable access. At the beach there is enough space for all boarders for rigging the sails and trimming the boards on a grass area. 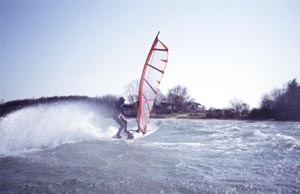 Windsurfing: It’s an all-round spot for advanced flat water fun and beginners. The first 100 to 200 metres off the beach are max. 1,50 m deep so You can take a comfortable break if You are in need of some resting. No need to think about Your waterstart when You are learning new manouvers in this area. A marina is situated at the spot and gives an area with calmer winds for the first steps on the water. If you go straight with your board into the bay some windwaves occur so it´s possible to get some air. The best wind directions for small or even higher nice bump and jump waves are from WSW to WNW. Easterly winds give gusty flatwater / speed conditions. Ohrfeldhaff is a nice sand beach with a comfortable situated and sized parking lot. The water stays shallow for quite a while and besides some small boats anchored in front of the beach there is nothing to care about. 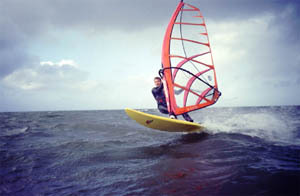 Windsurfing: Works best with winds from the east which come sideshore from the right. Northwest winds also work but push a lot of water out of the bay so be careful with Your fins. Strong easterly winds provide some miniscule waves that offer nice ramps for the first flight attempts. Kitesurfing: Very high fun ratio even with summer breezes. Enough room, shallow water for a long time help to perfect You kitehandling. Flytime with winds over force 5.
other activities: sailing in the Förde, riding Your bike through the very nice rolling hills in this area or just watch birds in the national parc.